Alice teaches Puppy SmartStart, Beginner, Out & About, Intro to Dog Sport, and Shy & Fearful Dog classes. Alice specializes in dog behaviour and is the co-ordinator and head trainer of the DOGSmart Reactive Dog Workshop, Reactive Socialization, and Reactive Out & About Class. As the owner and training director of DOGSmart Training Alice is a gifted, results-oriented trainer, who teaches practical, proven techniques to help your dog become a well socialized, fully integrated member of the family. Foremost among her objectives, is the value of relationship building between owner and dog. A popular trainer since 1994, Alice is a strong advocate of reward based positive reinforcement training as an effective way to train a dog and see consistent results over the long term. Alice is one of the first in Canada to achieve her CPDT-KA. Alice continues to educate dog owners and trainers alike through hosting seminars and clinics, speaking engagements and media. Alice is also Canine First Aid Certified. Alice is a founding member and President of C.A.R.E.S.S, a non-profit society providing education and resources for companion animal owners. 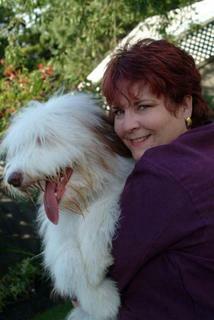 Alice, shares her life with her dog, Tequila Rose (Quila), a "bouncy" Bearded Collie. Speaker and Lecturer for DOGSmart Traning. Video Interview by CBC regarding dog training and children - how children should and should not interact with dogs. See video in the article called "dog training advice." Host of DOGSmart Training Rally O and Agility Fun Matches. Trout Lake Community Centre Dog Day Afternoon - Training demonstrations.